The last time that The Proclaimers were in Toronto, they very narrowly avoided a major misadventure. Their bass player almost tried the now infamous cronut burger before the legendary Scottish duo played at the Canadian National Exhibition last month. “We knew pretty much where the stall was and our bass player, he went past it a couple of times and he was going to get one. Thank god he didn’t because he was on a tour bus with us for eight days after that!" laughs Craig Reed. "We were very close to it. Too close. We’d never eat something that big before a show, but I know people who would." Craig and twin brother Charlie’s current visit to the city, in support of the world premiere of the musical "Sunshine on Leith" at the Toronto International Film Festival, is significantly less fraught with gastronomical peril, but it’s not entirely free of scandal, either. Some people back home in Edinburgh, where a significant portion of the musical was shot, were a little incensed that TIFF scored the first public screenings of the film. The brothers say they understand and appreciate where people in their hometown are coming from, though, and they’re happy that the UK premiere will happen there with a massive event on September 17. Edinburgh, and Leith in particular, have supported the twins since they started playing music together in the early eighties. They believed in the original stage version of "Sunshine on Leith", based on the wildly successful 1988 album of the same name and featuring classics like “I’m Gonna Be (500 Miles)” and “I’m On My Way” even before the Reids themselves did. As a result, the people of Edinburgh – and the Leith area in particular – are understandably protective of The Proclaimers and Sunshine on Leith. Locals -- and the press -- didn’t even want any scenes from the film version to be shot anywhere outside of the city. While a number of the interior scenes did have to be shot in Glasgow (and one or two had to be shot in – gasp– England), Craig promises that all of the exteriors were done back home. And he’s proud of how well Sunshine represents the city. Apparently the only thing that Edinburgh natives are more passionate about than the Proclaimers is football. The cast and crew discovered that firsthand when director Dexter Fletcher decided that a certain local pub needed to sport Hibernian F.C.’s colours for the purpose of one of the musical’s big numbers. “The Port of Leith pub in Constitution Street was never painted green,” says Craig. “It was always red,” adds Charlie. 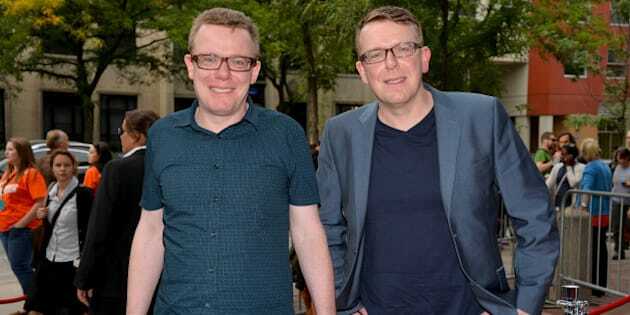 According to Proclaimers manager Kenny MacDonald, one incensed football fanatic slammed his half-finished pint on the bar and stomped out of the pub.